WHEN A FIREARM is used in a terrible killing or terrorism, the reaction on the left is invariably an emotional attack on America's gun culture. With visceral predictability, liberals cry out for lawmakers to ban more weapons, block more buyers, or otherwise "make it stop." 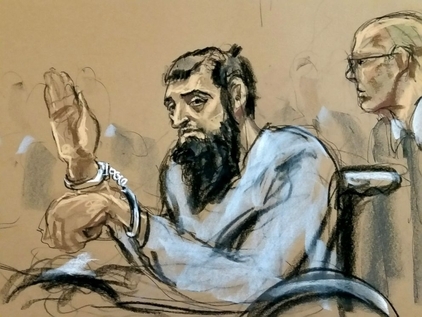 Sayfullo Saipov, the suspect in the New York City Halloween massacre, appeared in federal court on Wednesday. But when an immigrant is involved in a terrible killing or terrorism, the Pavlovian reaction comes from the right. Conservative Republicans slam America's immigrant culture, insisting furiously that immigration leads to terror, demanding that refugees be barred, or decrying the failure to deport more aliens. Sure enough, when authorities announced that Tuesday's terrorist rampage in Manhattan was the work of Sayfullo Saipov, an immigrant from Uzbekistan, many Republicans — led by President Trump — wasted little time blasting the immigration policy under which he had entered the country in 2010. Saipov was a beneficiary of the US government's Diversity Visa Program, the annual drawing in which 50,000 visas are awarded to would-be Americans from countries that don't send many immigrants to the United States. Often called the "green card lottery," the program was enacted by Congress in 1990 and signed into law by President George H.W. Bush. The odds of landing a visa in this way are minuscule — of the 14 million or so hopeful foreigners who enter the green card lottery each year, fewer than one-third of 1 percent ultimately receive permission to enter the United States. Saipov was one of the lucky winners. The jihadist horror he perpetrated on Halloween — mowing down pedestrians and cyclists on a bike path, leaving eight innocents dead and a dozen more wounded — was thus not only a crime of unspeakable evil. It was also an act of stunning ingratitude to the nation that offered him a home. At some point in the seven years since coming to America, Saipov apparently embraced radical Islam, with Tuesday's terrible consequences. But it makes no more sense to blame the carnage he committed on America's openness to immigrants than it does to blame the Second Amendment for Stephen Paddock's massacre in Las Vegas last month. 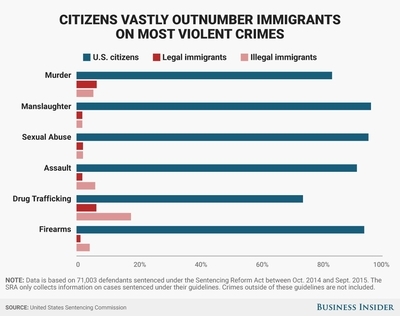 Just as the overwhelming majority of lawful gun owners never shoot anyone, the overwhelming majority of lawful immigrants never commit a crime. The share of immigrants who have killed Americans in domestic terrorist attacks is infinitesimal. From 1975 through this week's attack, according to Cato Institute analyst Alex Nowrasteh, a total of 3,037 people have been murdered on US soil by 182 foreign-born terrorists — and of those terrorists, only one-third (63) entered the United States on a green card. Since 1975, the annual likelihood of being murdered on US soil by a foreign-born terrorist has been 1 in 3.8 million. Home-grown killers pose a vastly greater threat. As a rule, Diversity Visa lottery winners are the most grateful of Americans. They deeply appreciate their extraordinary fortune in being here. They know how tiny the odds were of their being selected. They know, too, that they would have had no other lawful option — 95 percent of immigrant visas require applicants to be sponsored by a close relative who is already a US citizen, or by a US employer offering them a specialized job. Like all immigrants, winners of the green card lottery must be strictly vetted and pass a security check before getting their visa. But the only other requirements to enter the drawing are a high school education and at least two years' employment experience. For foreigners with no connection to America save a yearning to be American, the green card lottery offers a slim chance to get here by luck of the draw. It is the last, faint echo of what used to be America's open-doors policy, when anyone willing to uproot himself and move to the United States was free to do so — the policy that transformed 13 struggling colonies on the western Atlantic coast into the foremost economic and cultural power on earth. If Saipov is guilty as charged, he is an extreme outlier among legal immigrants, who are far less likely to commit crimes than US-born natives. Saipov, who won the Diversity Visa lottery and became a mass killer, is an extreme outlier, utterly atypical of immigrants in general and visa lottery winners in particular. Yet in response to the assault in Manhattan, the fever swamp churned with outrage over the green card lottery. Senator Charles Schumer, one of the authors of the original legislation, was demonized on Twitter: "You have blood on your hands, Chuck." Michelle Malkin, a popular Republican immigration hardliner, denounced "open-borders morons in both parties" for creating the "deadly Diversity Visa lottery." On Wednesday, Trump announced that he wants Congress to immediately repeal the program. "Diversity lottery," he said at a White House meeting. "Sounds nice — it's not nice, it's not good." Like the anti-gun hysteria that erupts on the left after a mass shooting, the anti-immigrant hysteria that erupts on the right when a foreign-born killer carries out an attack is disgraceful and irrational. Democrats long ago became the party of those who fear and hate guns. Now Republicans are on their way to becoming the party of those who fear and hate immigrants. Such phobic hostility diminishes the GOP, and will do nothing to make America great again.